A master of the postmodern fable, Crumey follows his exceptional novel Pfitz (1997) with a related, albeit more obscure, trio of interlocking stories derived in part from the troubled life of mathematician and philosopher Jean D’Alembert. Organized around to the same three categories—Memory, Reason, and Imagination—used by Diderot in his 18th-century encyclopedia, to which D‘Alembert contributed extensively, this collection begins with the scientist reviewing his past on the day of his death, focusing particularly on the one nonscientific love of his life: Julie de L’Espinasse, about whom he believed no scandalous rumor (and was mistaken). His reflections alternate with observations of his maid, Justine, who is summoned from her reading of her master’s papers by a madman at the door. 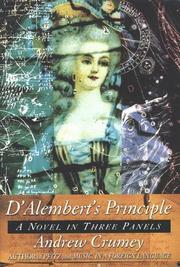 Said madman leaves her with a manuscript supposedly refuting D’Alembert’s lifework. This, “The Cosmography of Magnus Ferguson,” forms the second story, in which one Magnus Ferguson struggles to understand how he came from a different dimension to Scotland, taking the place of his twin in this dimension. Finally, the character Pfitz, whose existence was denied in the novel named for him, appears as a beggar in the streets of Rreinnstadt to regale a passerby with tales, the first of which lands them in prison. His subsequent tales concern matters as diverse as a Dictionary of Identity, never completed, and a marvelous clock never fully understood. Once the reader’s head stops spinning from trying to follow the intricate mechanics of the tale here, there is much to be enjoyed and admired. Still, Crumey’s effort doesn’t measure up to its less fragmentary predecessors. Something’s gone awry with the charm of his storytelling.